I was blessed with full and gorgeous plants this year! They really made my heart shine with joy. Note the appearance of a “fringed” edge of the upper left side of the petal. It is evident on each of the five flower petals. 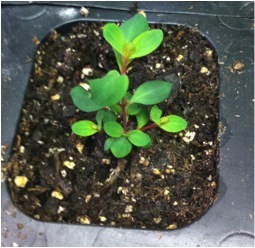 It’s easy to germinate St. John’s Wort seeds. I like to start them in early March here in South Central Wisconsin. It makes a huge difference how the seedling develops if you take the time to separate the tiny seedlings into their own growing cube. Otherwise, the seedlings become stunted if they are left to grow in a crowded condition. Be sure to handle the tiny sprouts gently making sure not to squeeze the stem. I’ve had St. John’s Wort March started seedlings flower the first year. Condition the seedlings gradually to the outdoor environment for a couple of weeks before planting directly in the garden. I do this by placing them on my screened in porch where they receive sunlight without frying the plants. They gradually strengthen to the outdoors. This is an important step to take if you want the seedlings to make it in the garden. Spring emergence! I’m always so happy to see St. John’s Wort return for another season. It almost rosette-like as the stems fan out from the root cluster. St. John’s Wort has the interesting growth habit of spreading wide like above before the stalks shoot upwards toward the sun. It looks very mat-like and at first you’d never guess that it will result in a two to three foot upright plant! Above is a photo of this year’s harvest of buds, flowers and few leaves. 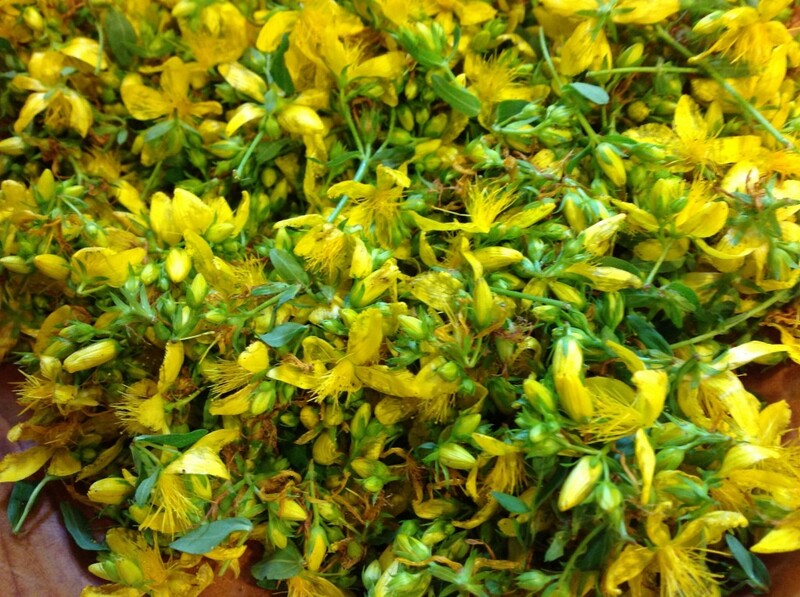 Ideally if one is lucky, you can harvest St. John’s Wort near the time of the Summer Solstice. That just seems ever so appropriate to me with it being the sunny plant that it is! Most years I don’t seem to hit that mark with harvest being somewhat before or later. But, this year I hit it right on the mark! I read about a couple of really helpful hints in Richo Cech’s book Making Plant Medicine. He suggested two things that stood out for me: 1) resist harvesting solely buds and flowers and include a few leaves because “the leaf contains active flavonoids which augment the activity of the compounds (hypericins) found in the flowers and buds” and 2) bruise or mash the freshly harvested plant before combining with oil. I tried both of these techniques and ended up with a gorgeous deep red tincture and infused oil. I’ve always used the fresh herb for making a tincture or infused oil. I’m drying some to try in an herbal tea formula this year. But, I primarily always go for the fresh herb medicine. I’ve made the tincture using 100 proof vodka and 190 proof grain alcohol. I find that the depth of the red is greater with the higher proof alcohol. So, this year I made a fresh herb tincture using one part herb to two parts alcohol (1:2) with 100 A (190 proof alcohol) straight over the fresh herb. I don’t weigh the herb out. Over time, I’ve found that when I weigh the fresh herb it results in a pretty equal amount to simply packing the jar with the fresh chopped herb. (However, I weigh the herb if using dried herb with the alcohol) So, I just pack the fresh herb in the jar, cover with the alcohol, poke with a stick to release air bubbles and label it. I note whether fresh or dry, proof of alcohol, date tinctured and where I gathered the herb, i.e. garden. As a final act of preparation I kiss the jar and hold it to my heart all the while saying thank you. Then I raise the jar in thanksgiving for all its healing gifts inviting spirit to infuse it too. After I let the tincture set for a day I open the jar and, using a spoon, press any herb that is flowing on top below the alcohol. This step seems to work well for the continued steeping duration of six weeks. I also shake the jar once in a while, re-open the jar and press the plant down again after shaking and then store it in cool dark place. 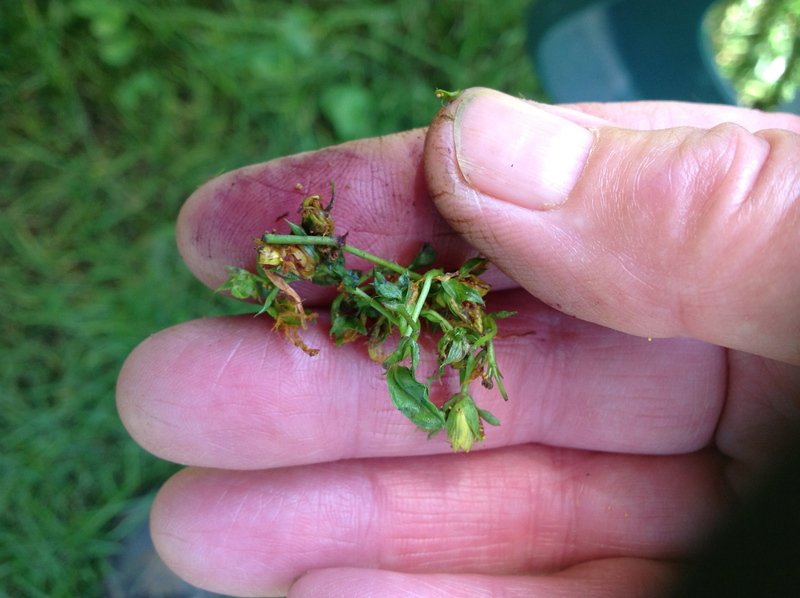 Test for St. Johns Wort readiness for tincture or oil making by squeezing a few buds between your fingers. You should have a dark red stain on your fingers from the release of the hypericin. This tells me that the plants are ready to harvest for medicine! Left jar is the wonderful St. John’s Wort tincture. Jar on the right with the cheesecloth drape is St. John’s Wort infusing in oil. Both are sitting in the brightness of full sunshine. I’ll bring them in before nightfall and return them to the sunshine the next day weather permitting. I like to make note of suggestions mentioned by my teachers along the way. 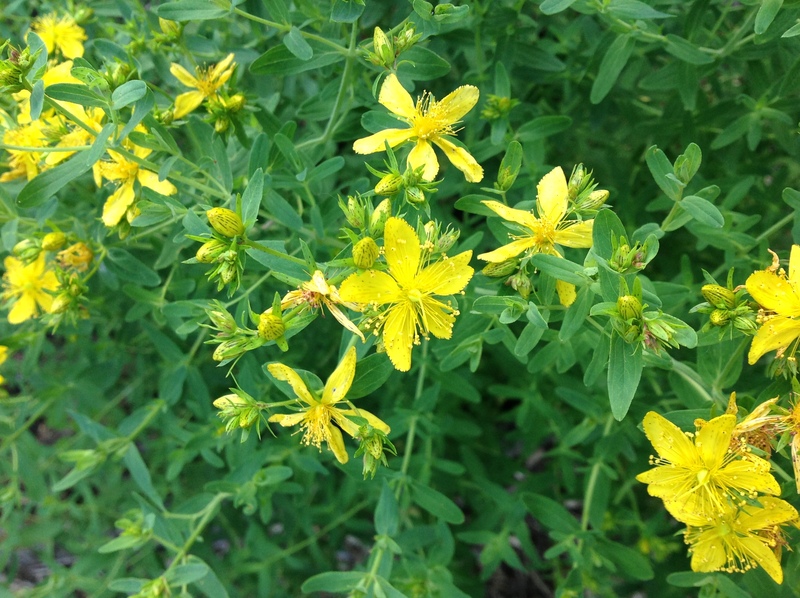 Susun Weed talked about the plant’s amazing ability to relieve muscle pain, suggesting that if you’re going to do a hard workout, that you take one dropperful of St. John’s Wort at the start of the work out and then one additional dropperful before going to bed. I’ve tried this and I was impressed with the positive outcome! No muscle pain the next day. Just last night during a class with Kathy Eich here in Madison she mentioned that St. John’s Wort was amazing on burns, for example, burns from chemotherapy, chemical burns, stove burns. She suggested using a combination of St. John’s Wort infused oil and lavender essential oil (1 ounce SJW oil: 3 drops lavender essential oil) directly on the burn. Kathy prefers to use the oil rather than a salve in burn situations because a salve holds the heat too much. A side benefit to this application is that the SJW/lavender oil reportedly anesthesizes the pain on contact. 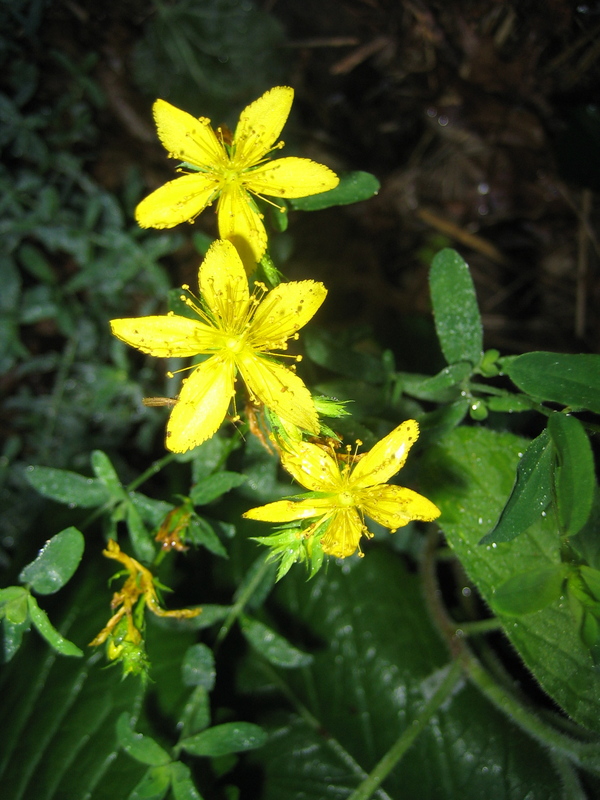 In the past, I’ve used St. John’s Wort oil on sunburns with great success. I guess I forgot about that when I heard Kathy reference it last night. That’s what I love about hearing different herbalist speak of their experiences. So many overlaps. It’s wonderful and helps bring the information to the forefront for me once again. 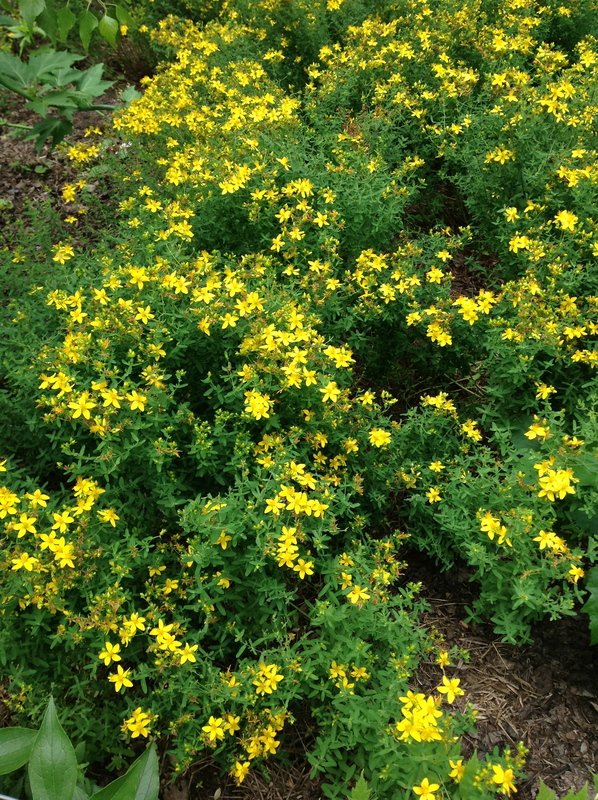 St. John’s Wort oil makes a wonderful massage oil for relaxing muscles, i.e. neck spasms. Using a combination of St. John’s Wort infused oil externally and the tincture internally is said to have a profound effect on nerve endings. Rosemary Gladstar offers us her “favorite liniment and remedy of choice for treating sore muscles, spastic muscles and cramps, and painful joints (including those caused by arthritis and bursitis)” she picked up from herbalist Nancy Phillips. Basically, you combine an equal amount of St. John’s Wort infused oil and St. John’s wort tincture (made with 190 proof alcohol) and add several drops of wintergreen essential oil. I would add a couple of wintergreen drops to begin, try it out and add more if needed. Be sure to label it for external use only and store in a cool, dark place. 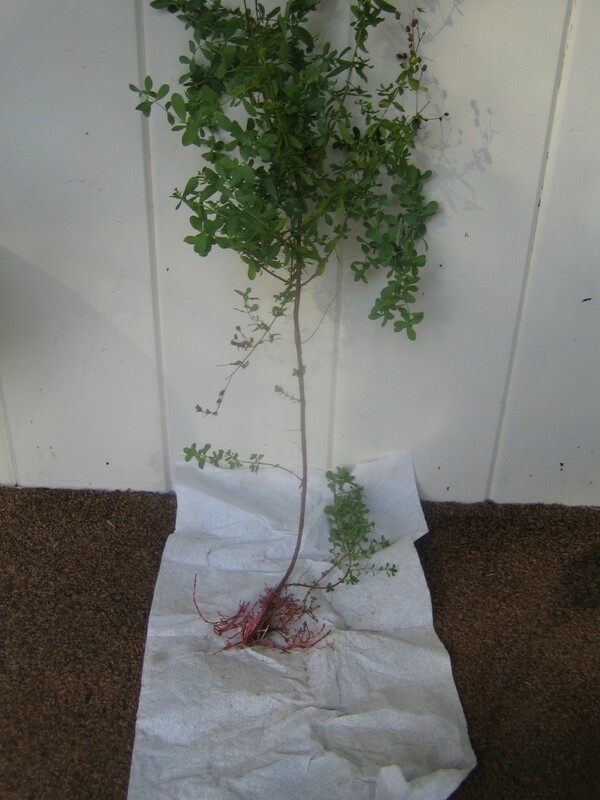 I was totally blown away when I accidentally pulled a St. John’s Wort plant up by the roots. I took the opportunity to get a closer look at the roots. I sprayed the dirt-filled roots with the garden hose to release most of the soil particles. 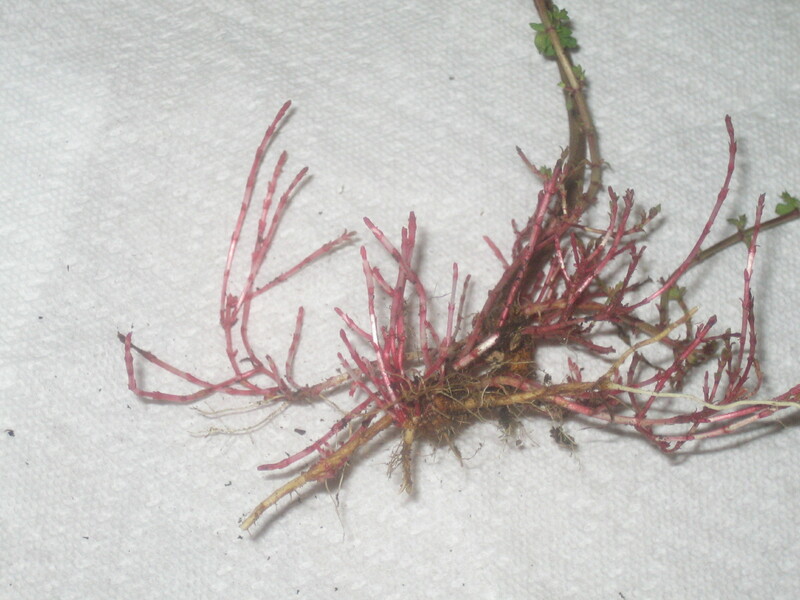 And to my utter amazement I discovered that St. John’s Wort’s root had red coloration. I couldn’t help but think of nerve endings! The roots appear ‘jointed’ in the way the coloration creates a striping effect. Really stunning stuff! The saying “as above, so below” comes to mind! Wow! Just wow! This photo captures the whole plant before it flowers – roots and all! Weiss, Rudolf Fritz. Weiss’s Herbal Medicine. Classic Edition.Thieme, Stuttgart, New York. 2001. Winston, David & Maimes, Steven. Adaptogens. Healing Arts Press, Rochester, Vermont. 2007. Personal notes from workshops with Susun Weed at the MidAmerica Herbal Symposium, Winona, MN. 2008. Personal notes from class with Kathy Eich, Red Root Mountain, Madison, WI. 2013. Primarily flowers & buds with a few leaves. Harvest the growing tips loaded with fresh flowers and buds together with a few small leaves that are part of the flowering top two to three inches. For optimum potency, harvest the herb in full sun and test the buds for the release of the notable red pigment by rubbing the bud/flower between your fingers. Infusion (tea): Dried flowering top primarily made up of flowers, buds and a few leaves. 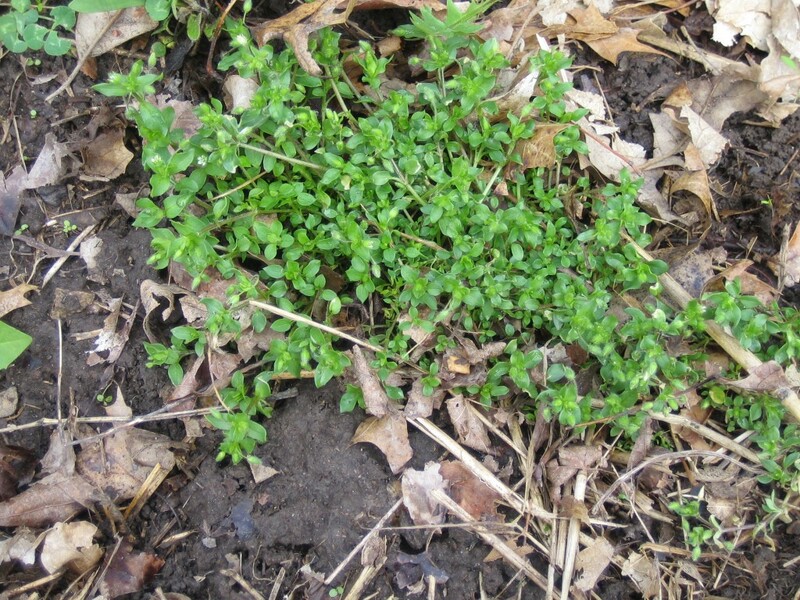 Tincture: Fresh flowering herb in alcohol of your choice, i.e. 100 proof vodka, 190 proof grain alcohol, using one part fresh herb to two parts alcohol. Infused oil. Fill a jar (size your choice & oil amount needed to cover herb in jar) with freshly harvested buds and flowers primarily along a few small leaves. 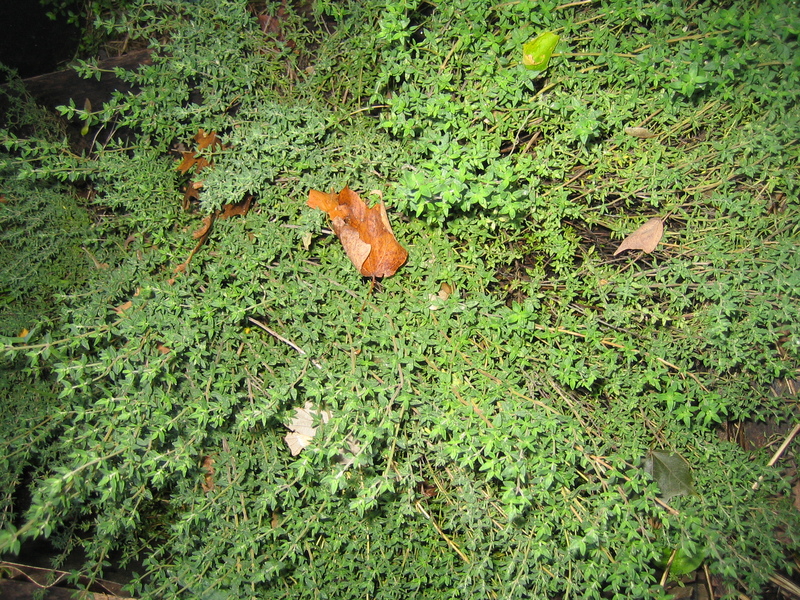 Cover herb with oil, i.e. olive oil, leaving one-inch headspace above plant material. Stir to release air bubbles. 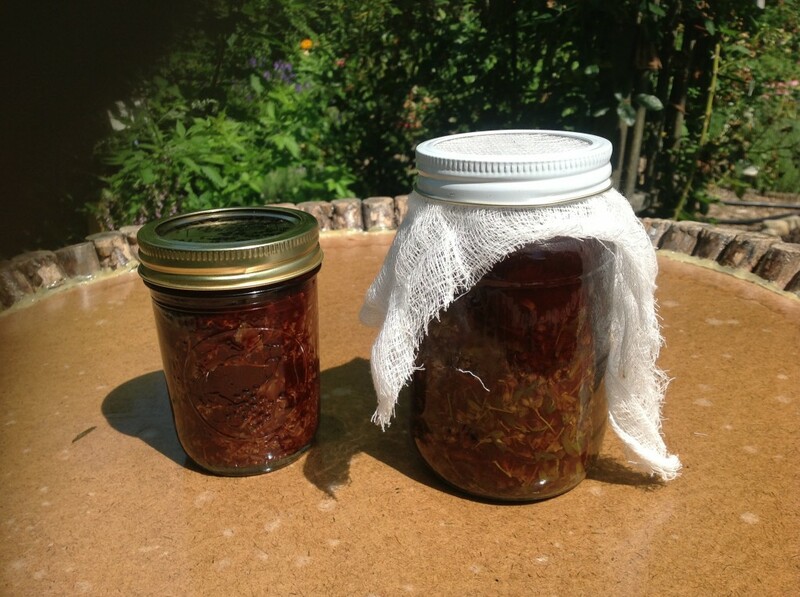 Cover with cheesecloth and secure cloth with a jar band or rubber band. Steep four to six weeks. This is the only herb I like to steep in direct sun. Be sure to bring it in before evening to avoid getting nighttime moisture in the oil. I'm convinced the sun deepens the red in the oil. Strain infused herb through cheesecloth. Do not squeeze the last remaining bit of plant material to remove oil or you run the risk of getting water droplets in your oil creating a muddy-looking appearance. Infusion: pour one cup of boiling water over 1 to 2 teaspoons of dried flowers/buds; steep 30-40 minutes; drink 4 oz. three to four times per day. (Winston) or infuse 10 to 15 minutes (Hoffmann).